DAVIS CITY, Iowa-Congressman Dave Loebsack admitted that he faces a tough race going into the 2018 Election. The Congressman from Iowa’s Second District, which includes southeast and south central Iowa, appeared at a series of legislative coffees throughout southern Iowa on Saturday to visit with constituents. While answering questions from the audience about the Healthcare bill the former college professor complained that he did not have time to read the 65 page bill. At the first event, a highway cleanup for Earth Day hosted by the Decatur County Democrats in Davis City, Loebsack acknowledged the challenge that the Democrat Party is facing in appealing to rural voters while talking about the Iowa federal delegation. 2016 was the most closely contested race that Loebsack has seen since his election in 2006. His unknown Republican opponent, Dr. Christopher Peters of Coralville received more votes than any previous Loebsack challenger. 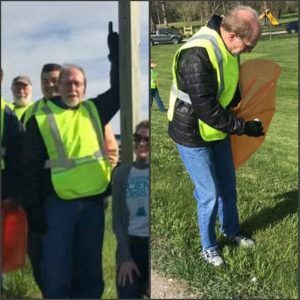 After a few minutes of picking up trash on the side of the road for photo ops, the Congressman continued his schedule of forums in southern Iowa.